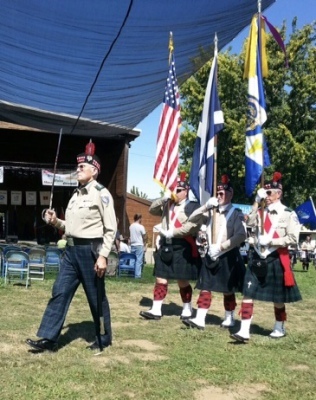 The Northwest Scots Guard is a family oriented 501-C-3 organization that promotes socialization, education, and celebration of Scottish Heritage and the many contributions that citizens of Scottish ancestry have made to building of our great nation. 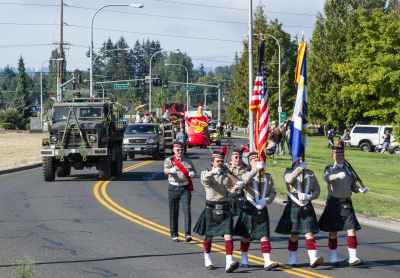 We are a volunteer organization with a mission to serve verterans, their families, and the community, The Color Guard unit of the Northwest Scots Guard provides services through presentation of the colors at parades, memorial services, funerals, weddings, festivals, and other commemorative events. Membership is open to all regardless of race, creed, or ethnicity. Services to veterans and families are free of charge. Services are offered free to Celtic festivals in return for free booth space. The NWSG marching unit has participated in numerousparades throughout Oregon and Washington. They have been awarded many trophies for the quality of their performance. Parades in which they have been asked to participate include the Portland, OR, Grand Floral Parade, and the Albany, OR, Veterans Day Parade. The NWSG participates in weddings where the bride and gromm request a Scottish style service, including bagpipes, and the arch of swords. 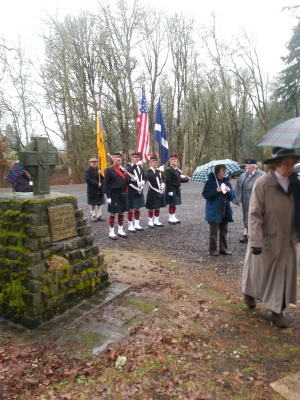 Members of the Color Guard wear their kilts and Glengarry bonnets to add to the festivities. The fee for this service is reasonable. The preision marching and regal uniforms of the NWSG add elements of respect and solemnity to any memorial service or commemorative event. Performances are adapted to the requests of families and organizations that contract for services. The NWSG provides services free of charge to veterans and their families. Celtic Festivals throughout Oregon and Washington have utilized the services of the NWSG to conduct opening ceremonies for their events. The Guard participates in as many as 16 such events during the year. The Unit consists of flag bearers, riflemen, pipeers and a drummer. Services to Festivals are provided free of cost in return for a booth site at their event.